I won't be recommending electronic appliances very often, but this one is awesome, the perfect holiday gift for the artist or coffee lover on your list -- the Aeroccino Plus Automatic Milk Frother. Fill it with milk, push a button and in seconds you have a heavenly pitcher of perfectly frothed milk. No fussing with that nozzle spewing hot water and steam all over the place, this magical machine takes all the pain out of making a perfect cappuccino. Chaz and I have had ours for over a year and use it every day. Thanks to everyone who responded to last week's survey "Andy Warhol: Genius or Killer of Art?" 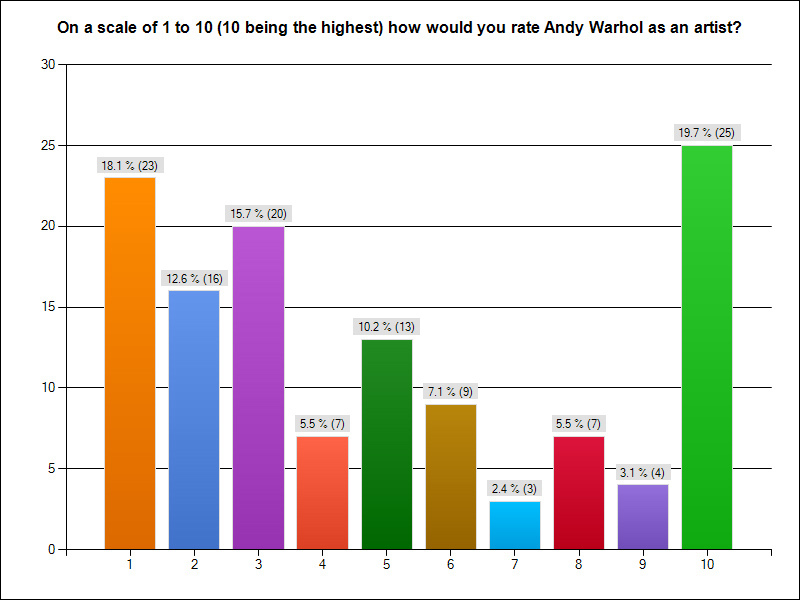 I asked you to rate Warhol's work on a scale of one to ten. The graph of the results (below, figure 1) shows a couple of interesting things, the first of which is that Warhol is a polarizing figure. Out of the 127 responses, 25 (19.7%) rated him as a ten, while almost the same number, 23 (18.1%) rated him as a one. If we leave out the extremes (1 and 10) in the second chart (below, figure 2), and then look how you rated his work, it becomes obvious that most of you don't think highly of the work itself. It peaks at a three and descends from there. 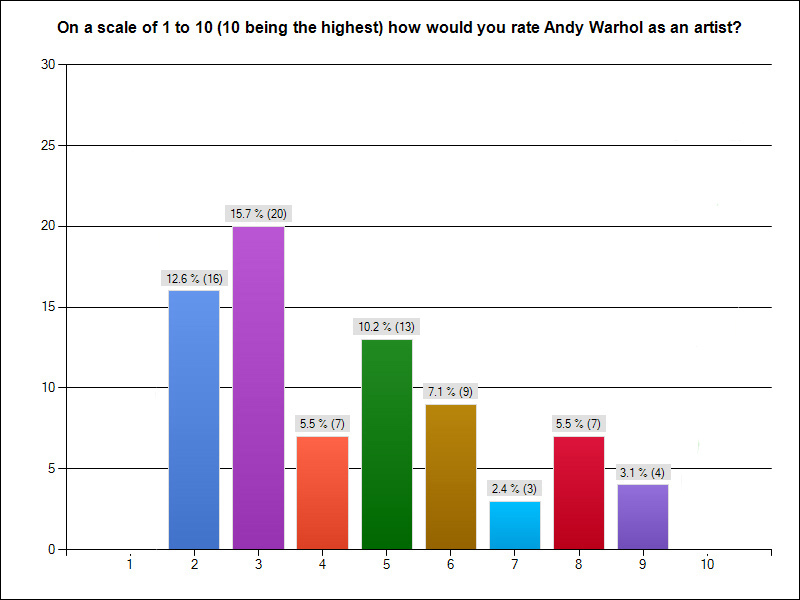 What I'm taking away from this, and from the many comments you left (see below), is that you think Warhol had a huge influence on contemporary art, but not so much for the quality of his work (only one or two respondents actually defended the work itself) but for the change he ushered in. Or as Marshall McLuhan put it: "Art at its most significant is a Distant Early Warning System that can always be relied on to tell the old culture what is beginning to happen to it." For better or for worse, Warhol was decidedly that. I think the debate will continue on whether or not Warhol's influence on art was primarily a good one. I agree with most of you that he knocked down barriers and allowed for an expansion of our definition of art. But, as Marshall Mc McLuhan also stated, "Art is anything you can get away with." It's the "getting away with it" part that bothers me about Warhol's legacy. I believe much of the contemporary art world suffers from a serious case of the Emperor's New Clothing, especially the art market that places so much value on Warhol that he accounts for a staggering one sixth of all contemporary art sales. "I am a huge fan of Warhol. Not so much that it has incredible merit for its technical aspects but most assuredly because it makes one ponder. Art for me has to stir up controversy and he most certainly achieved that status." "He was on the ground floor of appropriat­ion art, now ubiquitous­. But it is not at all a dry conceptual­ism--witne­ss his popularity­--but something ravishingl­y stylish, with an iconic, high modern classicism and Matisse-on­-acid color that does so much to redeem the general kitschines­s of the psychedeli­c aesthetic." "Is art a soothing, comfortabl­e arm chair after the toils of the day, as Matisse dreamed about? Is there only that one dimension? Should work not conforming to that definition be torn down? We don't need the self-indul­gent grunts of arrogant and wayward elites, do we? Maybe we should just reject the entire 20th Century." "He completely derailed the pre-existing canonical narrative of art history, defrocked its 'priesthood'; and liberated artists and art to move in many new directions via every medium and formal strategy under the sun. He's as important as Brueghel." "I owned a Warhol and got bored with it early on. Delighted to sell it." "Personally, I can't help but agree with the assessment that Warhol's serious work ended in 1968. When his retrospective was at MOCA, the earlier work seemed radical, the later just commercial. I loved the deKooning quote, "You're a killer of art!". I just saw de Kooning's retrospective at MOMA in New York. He reminded me of how great art can be. One can't help but think that Warhol's enormous influence has had a negative effect on today's art." "He was an ad man. There's a need for that, but I'm not certain it's in fine art. He was a master manipulator of the media and creator of self image. An ad man." "It has as much real substance as a can of Campbell's Soup. That is why collectors love him. He doesn't challenge the status quo in any way and the status quo is to make art = easy money." "I remember going to Pittsburgh and while there I visited the Andy Warhol Museum. A friend asked, 'How was it?' I responded, 'I liked it for 15 minutes.'" O.K. people- let me be blunt. If you don't believe that Andy Warhol is one of the greatest artists of all time, then you are ignorant. 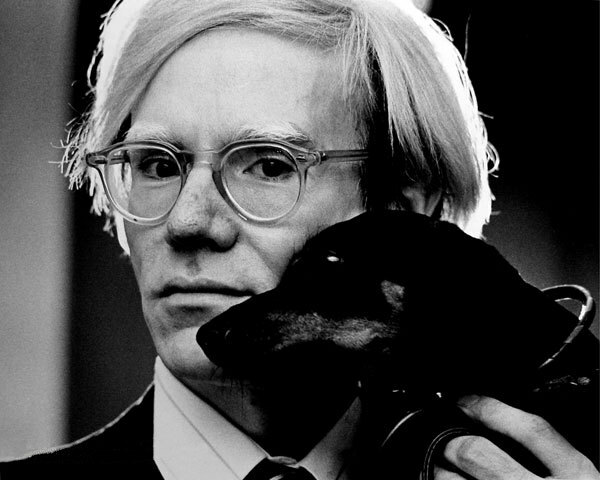 I'm sorry, but Andy Warhol is so important. You need to understand the context of his work. Take an art history class, please! P.S.- Don't be fooled by his seemingly crude techniques- these were reflecting the aesthetics of mass-produced products and the consumption of them by society. His techniques were actually quite inventive, especially in his late works which have recently gained more serious appreciation. The best part of Andy Warhol was his Interview Magazine and his ability to bring together the most innovative thinkers of our time in social venues. His "art" was gimmicky and tiresome. Warhol was to art what the Bush clan was to the world. Influential and devastating. This such a great help. Thank you for discussing all way long. I would like to try to some of your ideas.